A clock spring is a wire wound in a spiral shape around a spool like an analogue clock spring hence the name. 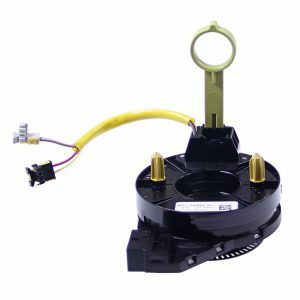 The clock spring allows the steering wheel to turn while letting the horn, airbag, radio controls, call control and cruise control on newer cars to continue working. 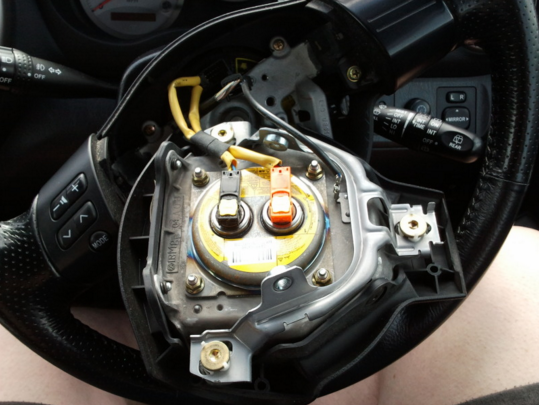 The clock spring is located between the steering wheel and steering column connected by multiple small groups of wires. Over time as the steering wheel is turned left to right many times, these wires can fray or fatigue causing an open or short circuit which would result in a broken clock spring. If this has occurred on your car the airbag warning light will turn on and could be potentially dangerous if you are in a crash because of no airbag. This will also stop all other devices that run with through the clock spring with the airbag such as radio controls, horn, cruise control and more. If your clock spring is starting to fail intermittently you may start to notice that the horn does not always work reliably every time, and your Airbag / SRS light may come on randomly on your dashboard. This can sometimes happen when the steering wheel is turned a particular direction. If you Airbag / SRS warning light is on at Warrant of Fitness (WOF) time, then you will fail your Warrant of Fitness (WOF). It is highly advised to get the clock spring diagnosed and fixed as soon as possible as it controls two important safety features (Drivers Airbag and Horn) and you cannot pass a Warrant of Fitness (WOF) with a faulty clock spring. This will require a diagnostic scan of the cars Airbag / SRS computer and often an investigation and diagnosis of the Airbag / SRS live data. It is potentially very dangerous to drive your vehicle in this condition and should be avoided if at all possible. If your car’s clock spring sensor is damaged, then at Grimmer Motors, our talented and reliable mechanics can help. Our mechanics can easily diagnose and replace a damaged or failed car steering wheel clock spring and get you back on the road in no time. At Grimmer Motors we offer a range of diagnostics and repairs. In order to do this, we own a variety of powerful tools and use a range of our diagnostic tools to scan, test and diagnose your car. For all clock spring or steering wheel checks in Hamilton, contact Grimmer Motors today!